Several professionals are involved in the instructional design field. However, do you know the full range of what an instructional designer does? A large group of ASU Instructional Designers and Technologists were asked to tell about the work they do! 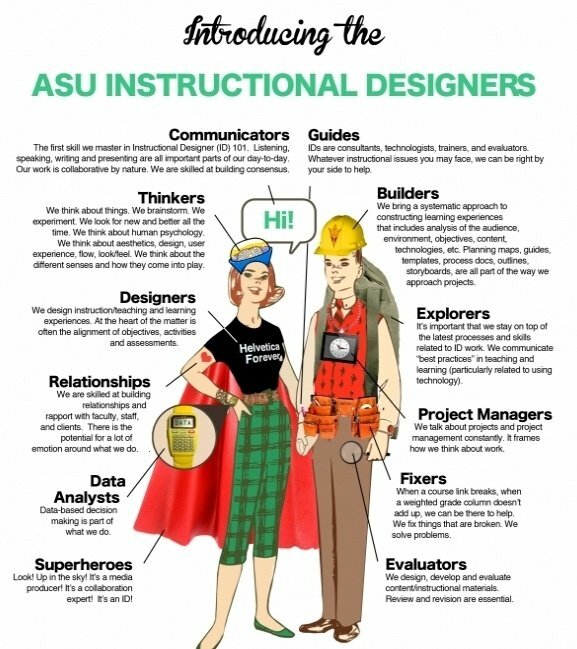 The Introducing the ASU Instructional Designers is a great instructional design infographic based on these finding and produced by Arizona State Univeristy (ASU). In addition, I highly encourage you to read the following 7 Instructional Design articles. We often hear about the debate of how Subject Matter Experts meddle with Instructional Strategies and how Instructional Designers do not have the freedom to develop their own product. In this debate we often forget about the target audience, and finally end up creating something for the Subject Matter Experts. This article talks about how sticking to the Instructional Design basics would help satisfy both the Subject Matter Experts and the target audience. At the following post I will give my perspective concerning "What Instructional Design really is?" "What Instructional Designers Do? ", and I will talk about "3 Instructional Design Myths". You constructive feedback will be highly appreciated! One of the main concepts that leads to successful e-Learning course design is Information Chunking. But what is chunking? Why is it embedded in the world of instructional design? And what kind of chunking strategies can an instructional designer use to enhance learning? Getting into instructional design is a very desirable career choice at present, and so many people want to get into it but are often not sure where to start. What skills Instructional Designers need? What will the hiring manager or interviewer be looking for? Is it necessary for an Instructional Designer to be a Subject Matter Expert?Should the roles of Instructional Designers and Subject Matter Experts be consolidated or autonomous?